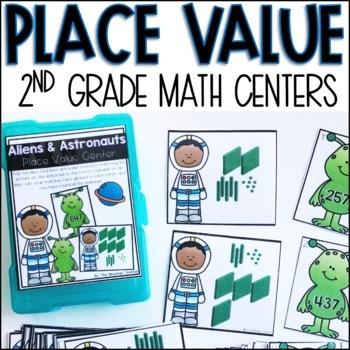 Five space themed place value centers and activities, plus recording sheets for the centers and a final assessment. 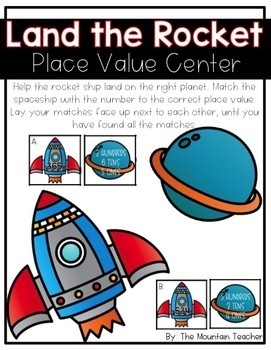 This is a great addition to your place value unit! It hits expanding numbers, understanding base ten, comparing numbers and place value. -Alien vs. Astronaut - Help the alien find their astronaut friend! Be sure to record your answer, the picture and try writing the expanded form as well. - Find the Spaceship - Help the aliens find their spaceships! 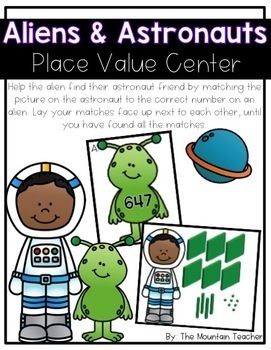 Match the correct alien with his spaceship then record your answer, then confirm with a picture! - Land the Spaceship - Help the spaceship land on the right planet! 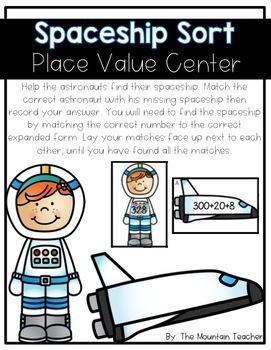 Match the spaceship to the correct written form, then record your answers and draw a picture to go with! - Picture Place Value - Use place value blocks to build each number, then record the answer with a picture on the recording sheet! - Pre & Post Quizzes - These are pre and post quizzes, assessing knowledge of expanded form, place value, comparing numbers, and understanding base ten. - Final Assessment - This is a final assessment, assessing knowledge of expanded form, place value, comparing numbers, and understanding base ten.